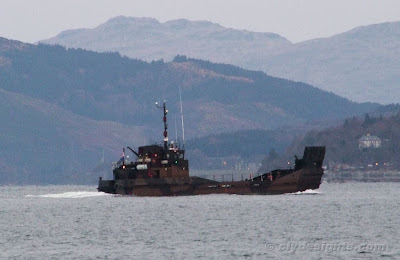 One of the six small landing craft operated by the Royal Logistic Corps was seen heading for Faslane on Friday morning. These craft, built by James Stone at Brightlingsea between 1984 and 1987, are 33 metres in length, and can carry a payload of around 100 tonnes. This vessel - AUDEMER - was built in 1987 and was one of the last of the class to join the RLC. A 360 degree tour of the vessel can be seen on the Royal Logistic Corps' website.